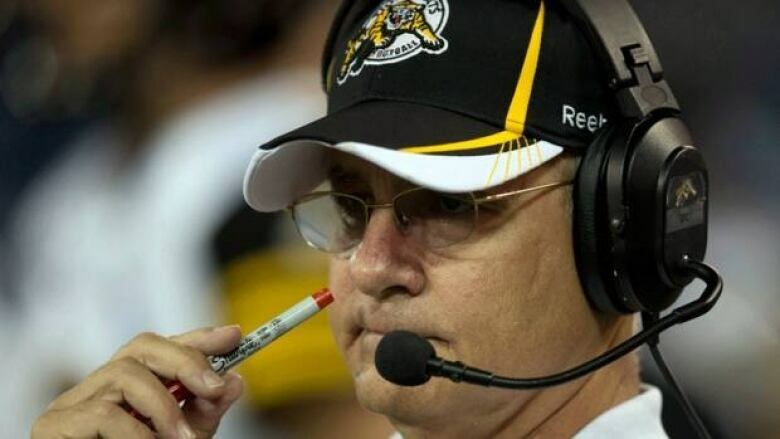 The Hamiton Tiger-Cats face a must-win situation at Rogers Centre Thursday evening when they take on the Toronto Argonauts. The Ticats need a win combined with an Edmonton Eskimos loss on Friday evening. The huge diamond ring that adorned George Cortez's right hand Wednesday was proof anything is possible once a team reaches the CFL playoffs. The impressive piece of jewelry was none other than the 2001 Grey Cup ring Cortez received as an assistant coach with Calgary. That year the Stampeders struggled to make the playoffs with a dismal 8-10 (including one overtime loss) record but capped an improbable championship run with a stunning 27-19 win over the heavily favoured Winnipeg Blue Bombers at Montreal's Olympic Stadium. Eleven years ago, Calgary had to win three of its last four regular-season games — including a 22-15 victory over Winnipeg in the final week of the season — to clinch second in the West Division, one point ahead of the B.C. Lions. Cortez's current team, the Hamilton Tiger-Cats, faces a similar situation Thursday night in its regular-season finale versus the Toronto Argonauts. Hamilton (6-11) must beat Toronto at Rogers Centre and hope Calgary defeats Edmonton on Friday night to clinch third in the East Division. But either a loss to the Argos or an Eskimos win will eliminate the Ticats from playoff contention. "We went to the last game of the year in '01 having to win to make the playoffs and we did and ended up winning the Grey Cup," said Cortez, who's in his first year as Hamilton's head coach. "I kind of used [the ring] as a prop one day talking and have worn it, kind of, as a little bit of a reminder. "We were sitting almost in exactly the same point with three games to go in the season in '01 as we are this year." Cortez said he doesn't wear the ring often but is doing so to deliver a very simple message to his team. "Even when things look like they're down and out at times, the whole object of an 18-game exercise is to get into the tournament," he said. "Once you get into the tournament anything is possible." This is the fourth and final regular-season matchup between the two teams but Hamilton will face a much different Toronto squad. With the Argos (8-9) cementing second in the East Division with last weekend's win in Regina, head coach Scott Milanovich is resting no less than eight starters, including quarterback Ricky Ray. "A lot of it is, really, injuries and trying to get guys healthy," Milanovich said. "Fortunately we have the opportunity to do that." Also, starting linebacker Brandon Isaac will serve a one-game suspension for a helmet-to-helmet hit last week on Saskatchewan quarterback Darian Durant. Milanovich will start backup Jarious Jackson, who's expected to play a quarter before giving way to rookie Trevor Harris. Milanovich also wants fellow rookie Zach Collaros to play. "With Zach and Trevor it's a chance for us to get them some experience in a situation you don't find in pre-season," Milanovich said. "This is a real game with a team that's fighting for its playoff life. "I think we're going to get a good idea of what kind of poise they have and what they can handle at this point as we move forward." Cortez said his team isn't the least bit concerned about Toronto's multiple lineup changes. "We're not worrying about who's playing for the Argos," he said. "It could be the '97 Argos defence ... we only worry about our team and how we perform. "We're approaching it that they're playing the best guys they think are best for them and we're not going to worry about that." But the abundance of new faces in Toronto's lineup certainly creates an element of the unknown for Hamilton heading in. "Obviously we know what Ricky likes to do ... but you never know with these guys coming in and what they're capable of," said Ticats linebacker Rey Williams. "They're not here trying to lose the game, they're trying to win. "They're going to play hard, we're going to play hard and the best team will win." Toronto's Chad Owens has plenty to play for. The receiver/kick-returner needs just 73 yards to break Mike (Pinball) Clemons' single-season record of 3,840 all-purpose yards and 233 to become the first player in pro football history to break the 4,000-yard plateau. Owens is also the CFL's leading receiver with 91 catches for 1,289 yards, 45 ahead of Calgary's Nik Lewis — who isn't expected to play against Edmonton — and 83 yards in front of Saskatchewan's Weston Dressler. "It's important to me for Chad," Milanovich said. "Chad has waited a long time to be a featured receiver, to be in an offence where he's a huge part of what you do. "He has always been a great special-teams player and for him to be able to go as long as he has with the load we've given him says something about his toughness and he's deserving of the recognition. But I'm not going to call extra plays to get Chad the ball any more than we already try to get him the ball." Owens displayed the loose, comfortable attitude that was prevalent among Argos players Wednesday, donning a light blue contact lens to celebrate Halloween. And while breaking Clemons' record is important, Owens said it's not something he's dwelling upon. "I know it would mean a lot to my kids, my son especially," Owens said. "Down the road later on when I'm done playing it should have a lot more meaning then, at least for me anyway. "This is [Hamilton's] playoff game and there's still no guarantee they'll get in even if they win. They're going to give everything they've got and we've got to match their intensity and be prepared for a tough, physical game."